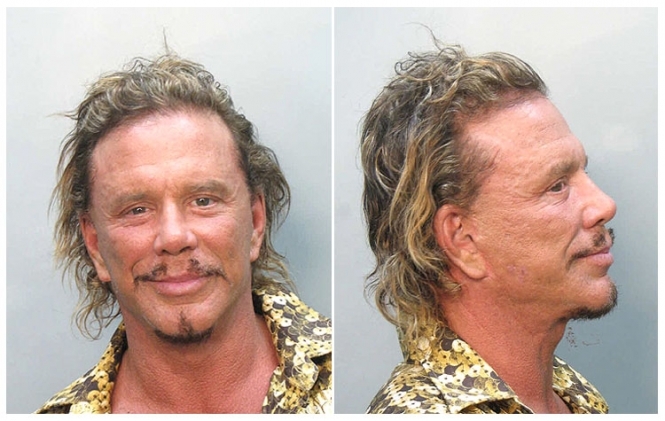 Actor Mickey Rourke was arrested in November 2007 by Miami Beach police and charged with driving under the influence. According to cops, the 'Sin City' star was seen making an illegal U-turn on his Vespa scooter and then weaving across the road. Once stopped, police noted that Rourke had bloodshot eyes and smelled of booze. He also didn't perform well on a series of sobriety tests. Rourke, 55, was then transported to the Miami-Dade County jail where he posed for the above mug shot and was held on $1000 bond. Submitted by nastynorm on Sat, 2010-12-11 00:51. THE BAR FLY WAS A PERFECT MOVIE OF HIM. Submitted by Shelly Shores on Tue, 2010-08-31 04:19. Submitted by CherokeeSwede on Sun, 2010-08-29 13:16. He is a great actor and was very handsome until he had the plastic surgery. No Julia Roberts is not his sister...her brother is Eric Roberts. Submitted by CRASHLANDED on Thu, 2010-08-26 23:42. I LIKE )SOME( OF HIS ACTING, BUT HE IS NOT REALLY A HANDSOME MAN. ISNT JULIA ROBERTS HIS SISTER? ?